Max Bullough is a two-time first-team All-Big Ten player, a third-team All-American and a first-team Academic All-American. Stunning news came from Michigan State Christmas night, just days before the Spartans were to play Stanford in the Rose Bowl. The school announced that senior linebacker Max Bullough has been suspended for the rest of the season for a violation of team rules. "It is extremely disappointing for all parties involved," MSU coach Mark Dantonio said in a statement. "We will stay focused and close ranks as we prepare for Stanford on January 1 in the Rose Bowl. Max will forever remain a Spartan and valued member in this team’s achievements. "We will have no further comment on this issue." 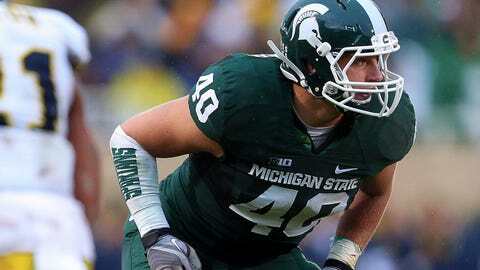 The Spartans traveled to Pasadena, Calif., Wednesday, but Bullough was not with the team. Dantonio recently accompanied Bullough to New York, where Bullough was a finalist for the William V. Campbell Trophy, which goes to the best scholar-athlete in the country. Bullough is a two-time first-team All-Big Ten player, a third-team All-American and a first-team Academic All-American. He was third on the team this season with 76 tackles, 9.5 for loss. He also had 1.5 sacks. For his career, Bullough ranks 11th in team history with 305 tackles for loss and is ranked 18th with 299 career tackles in 53 games. The Bulloughs have been a part of Michigan State football for decades. His grandfather Hank (1952-54), father Shane (1983-86), uncle Chuck (1988-91) and uncle Bobby Morse (1983-86) all preceded him at Michigan State. His younger brother, Riley, is a redshirt freshman on the team. Bullough told the Detroit News last week about the meaning of carrying on the Bullough name at Michigan State. "They’re just as excited as I am," Bullough told the Detroit News. "I think anytime you have a kid playing on a team — my dad has two of them — and you played before, you’re kind of living through them again. You live and die with what they do, what the team does." Bullough’s team-leading streak of 40 consecutive starts will end one short of what was his dream, the Rose Bowl.